October has been full of great golf experiences! First I played the Chris Kirkpatrick Foundation Golf Tourney. It was a great way to kick off the month and my birthday week. My foursome consisted of Ginny, Sue and Tony. Ginny and Sue and I have been playing together for quite a while. Poor Tony had no idea what he got himself into but in the end he had fun. There were many cool elements to this tournament. Many restaurants came out and did sampling at various holes. There was a hair salon that had you hula hoop for vodka shots. And then there was “Nerves of Steel.” This was a group of entertainers that tried to rattle you as you teed off. They tried to be distracting but they had never met Sue and I. I think in the end we rattled them! Also Medicus Golf was out there letting you try their new Overspin Putter. If you’re in the market for a new putter I suggest you check it out. And if you’re in the market to buy, you can save 10% by using coupon code CKF10210. Check them out at www.medicusoverspin.com. 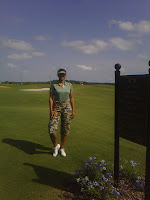 My second tourney was EWGA Women Playing for T.I.M.E at Reunion Golf. This tourney was a “PINK” event in support of Breast Cancer awareness. My foursome consisted of Merrily, Debbie and Ginny. We had a great time even though we came in last place! Clearly we didn’t buy enough mulligans! Who knew there was a strategy to playing tournament golf. In between my golf tournaments I played with my cousin Kiilu at Orange County National. I made the misfortune of talking lots of trash before our game which seemingly motivated Kiilu to bring his “A” game. I didn’t mind eating crow. It was a beautiful day and he gave great tips. I also had a chance to catch up with my dear friend Billy. 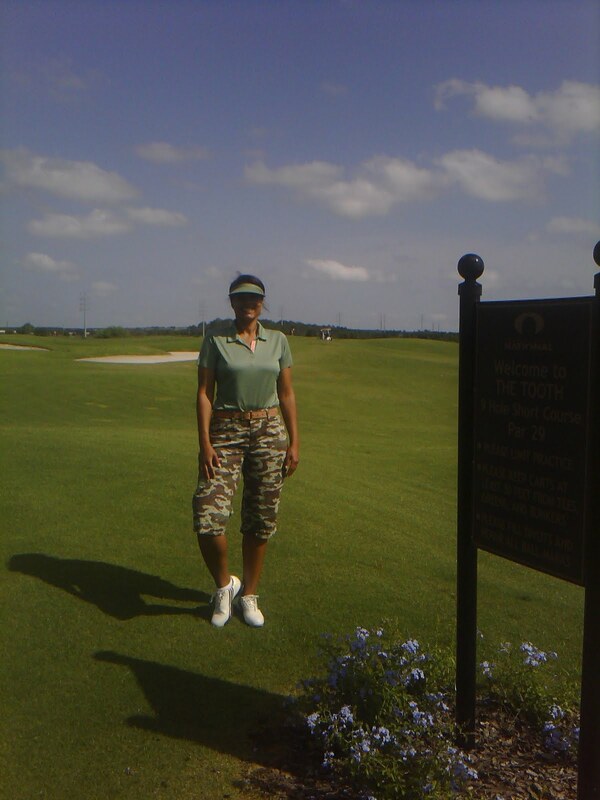 We played at Hunters Creek. A great course for long hitters. We really had fun and Billy was impressed on how far my skills have come in such a short time. I had an awesome day! Lastly, I closed out the month playing the 2nd Annual Leads and Links tournament sponsored by the Central Florida National Black MBA Association. This tournament was at Celebration Golf. I played with Roberto, Mike and Mark. It was the first time we met even though we all work at the same company. This tournament was also a best ball scramble. I quickly found my role in this tournament. I was the long hitter from the forward tees. Whoo hoo! Yes, October was full of great golf, fellowship and fun! I can’t wait to see what the rest of the year brings! Categories: Uncategorized Leave a comment ?